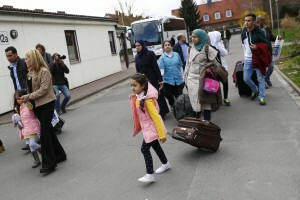 WASHINGTON — A top European Union official urged the United States on Thursday to accept more refugees fleeing the civil war in Syria, saying that asylum seekers should not be equated with violent extremists. Stavros Lambrinidis, the EU’s special representative for human rights, said that taking in more refugees would help ease the pressure on Europe, which is facing a massive refugee crisis. “To the extent that we can all understand this global issue and share the responsibility, this will clearly alleviate the pressure on Europe right now and Greece in particular,” Lambrinidis said at the Center for Strategic and International Studies. The U.S. annually accepts 70,000 refugees from around the world. This group includes people fleeing violence, religious persecution and war. The Obama administration announced last year that the number of people invited to move to the U.S. as refugees would be increased to 85,000 in 2016, including about 10,000 Syrians. Lambrinidis said that while it was important for authorities to be vigilant in screening migrants, the anti-refugee rhetoric that is on the rise in the U.S. and the EU is alarming and undermines the countries’ international obligations. Europe has seen a rise of far-right parties fueled by the refugee crisis and terrorist attacks in European capitals. In the U.S., Republican presidential front-runner Donald Trump has called for temporarily barring Muslims from entering the country and refusing entry to Syrian refugees.